A fantastic book review by ‘Deep-ends’. Would love your comments and also what you thought of the book if you have already read it. This book is not new. It has been out for quite a while and I read it a few years ago but I recently recommended it to a friend and she came back from her holiday raving about it! A historical novel set in the middle ages, the story is basically about 2 men; Tom the Builder, and his life-long dream to build a church, and Brother Philip a young, ambitious monk who helps Tom realize his dream. The story spans about 30 years, which is what it takes to build a gothic cathedral in the 12th century England. Keep in mind that this was an era in which life expectancy was no more than 40 years. Follett has done an excellent job, capturing the feeling of a period when religion and anarchy went hand in hand. The research that went into this book was excellent. The characters are all well developed, from the staunchly religious monks, the hard-working, superstitious commoners to the nobles and gentry with their sense of entitlement. Brother Philip struggles with pride and ambition, Tom pursues his dream at the cost of his wife, and he basically sacrifices his newborn son to save the rest of his family. Nobody is perfect – all of the protagonists have their flaws that make them undeniably human. Don’t let the size of this book overwhelm you; it is 973 pages but the story moves along at a surprisingly quick pace for a novel of this length. My recommendation…read this book. It is simply riveting. But be warned! 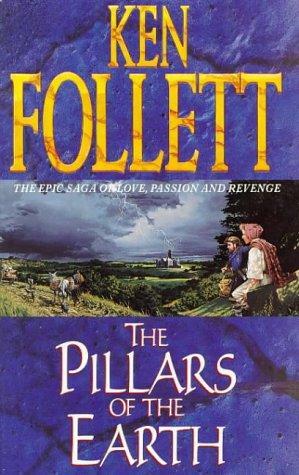 Pillars is a compulsive page turner, so if you are planning to catch up on your sleep, don’t even start reading! I could not put the darned thing down! Previous A happy 5th to me, and many more to come!